PC users often think how to remove or uninstall antivirus programs that stuck up in the program files of their windows operating systems (windows 2000, windows 7, windows 98, windows vista, XP and for both windows 8/7). We all know that Symantec Norton antivirus is the powerful virus removal tool to give fight against all malware functions in your PC when the time comes to uninstall or shift to antivirus software; Norton setup file doesn’t uninstall easily it’s a bit annoying thing for Norton product users. To clear this bug Norton has come up with Norton removal tool 2013 which is a handy to those who wish to get rid of previous Norton tools that refuse to move away from the computer programs and features. 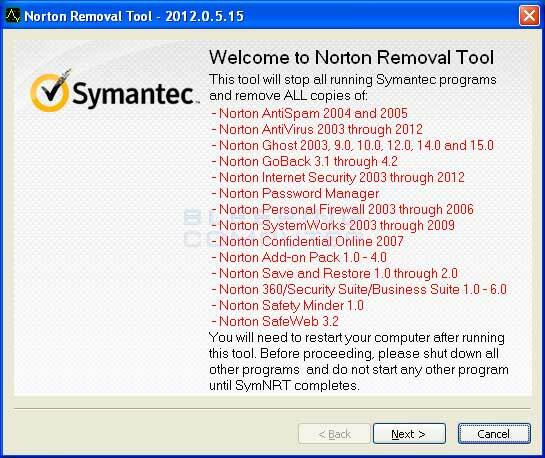 Norton removal tool is easy and simple to use software program that can perform effectively in means of removing any hidden Norton software in the system without corrupting the other program files. The process is very simple all you have to do is initiate the process and reboot your system once the operation is completed.